Mom Among Chaos was given Cordskinz to facilitate an honest review. No other compensation was given. All opinions are 100% our own. Full Policy Here. 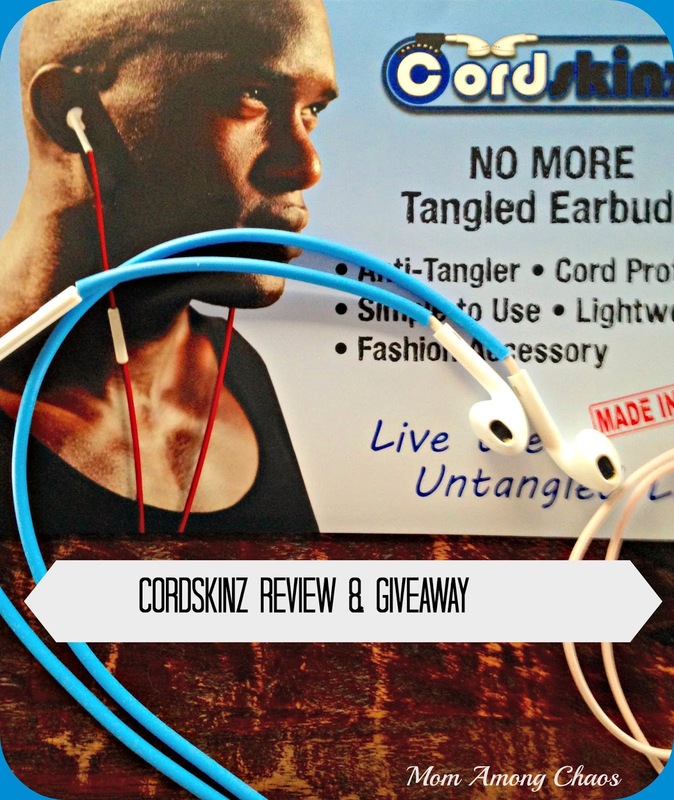 Cordskinz are made to stop tangled earbuds. I think we all have had this happen to us. Usually, I'm at the gym racing to get to a class and find my ear buds tangled. Well, with Cordskinz that doesn't have to happen any longer. No more spending 5 minutes getting those pesky knots out. The skin also works as a cord protector. Your earbuds are less likely to break. Cordskinz are super easy to apply to your ear buds. If I can do it, anyone can. They give you a tool, along with very simple online video directions. The right cord is covered. Then I used the skinner tool to cover the other one. They come in the following 11 colors: black, clear, glitter pink, ice blue, lavender, lime green, yellow, red, sky blue, smokey clear, and white. With that many choices, you can make a bold statement. Currently, they are running a special deal. You can save up to $19.98. To get this offer put one of these codes in at checkout: 3 for 2 or 6 for 4 (make sure you have the spaces included). Would I recommend Cordskinz? If you're into matching your phone, no more tangled cords, and having the hottest accessories, then yes. Also, these would be great for a tween or a teenager for protecting their earbuds and headphone cords. Maybe even order a few to add to their Easter basket gifts. You can order online at www.cordskinz.com or on Amazon. Enter to win your own set, from Mom Among Chaos, in the form below. Ends 4/1/15. Winner must reply within 24 hours or a new winner will be chosen. Giveaway open to US residents only. Prize supplied by Cordskinz. Winner is subject to eligibility verification.